Re-enactment of Gallipoli landing from Jax on Vimeo.Today was ANZAC Day in Australia and New Zealand. ANZAC stands for Australian and New Zealand Army Corps, which was established as a British Empire Colonial Force during World War One. 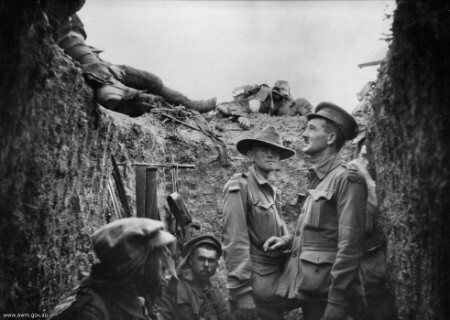 ANZAC Day is held annually in Australia and New Zealand, beginning with a 4.30am dawn service to commemorate the ANZAC amphibious invasion of the Gallipoli Peninsula, in the Aegean Sea, Turkey, in what was then the Ottoman Empire, on the morning of 25 April 1915. The operation was a failure, and 8 months later the ANZACs along with the British, French, Indians and Canadians evacuated the siege on the Ottomans, with combined casualties of 392,338 (the vast majority Ottoman). This was the beginning of Australia's involvement in WW1, and many in Australia strangely believe it to be a nation defining event! In Australia, ANZAC Day, along with Remembrance Day, has come to commemorate many wars that Australians have participated in. Some have even forgotten the associations with New Zealand. The wars not remembered however are the Australian Frontier Wars, The New Zealand Wars, The Boer Wars, or the many secret special operations carried out by Australia's Special Air Service and Special Operation's Force. Nationalism in Australia, is sadly defined by limited perspective on war. In school we are taught some bizarre story about how or what WW1 was about. Something to do with an assignation of an Arch Duke in Europe, leading to a crisis between Germany, France, England, and other colonising imperialists.. and somehow that crisis in Europe lead to ANZACs being deployed across the Mediterranean, Middle East, and Europe. Some say WW1 was actually a British campaign to prevent Germany completing a railway from Berlin to Baghdad, and securing it's interests in oil there. They say WWI was the first of many oil wars to come (9.27 Mins). The way in which Australians remember their wars is important to me. My teenage friends and I spent most of our adolescent years dreaming of the day we would 'serve' in what was a kind of right-of-passage to us as boys to be men. Some of us went on from Army Cadets to join the Army. I joined the 1st Commando Company. While I dropped out pretty soon after my initial training, others stayed at it. Had I stayed, I might have ended up in the 2nd Commando Regiment, deployed to Afghanistan and possibly even participating in that terrible masacre there. I can hand on heart say, that ANZAC day, along with many movies, inspired and motivated my interest in a combat military career. Lucky for me, I found a girlfriend who cured me of such junk thinking. If we as a nation and as individuals, could remember war differently, without the nationalism, militarism, fetishism, suggestion to boys of what it means to be men... if we could cease using words like service, suprime or ultimate sacrifice, bravery, valour, and others like it... if we could rethink our memorials and museums... if we could instead stay away from nationalistic gatherings - hopefully in the peace and love of our friends and families, reflecting on the true and untold costs of war, remembering the parts we each play in causing our conflicts and wars, and even burning effigies of politicians and corporations who failed in their honesty, diplomacy and setting right their many injustices of the past and soon-to-be-present, then ANZAC Day would be something I would maybe participate in.